“When the first edition of this book was published, in 1992, it was greeted with a storm of controversy no less fervent than the debate that met the publication of Darwin’s theory of evolution one hundred and thirty years ago. 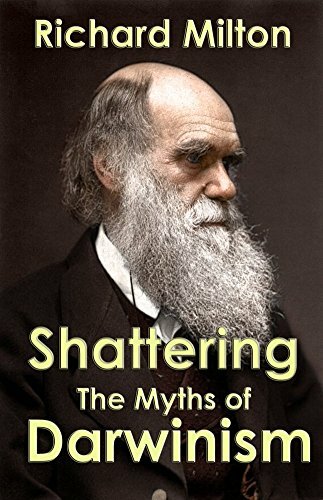 When Shattering the Myths of Darwinism was published, I expected it to arouse controversy, because it reports on scientific research that is itself controversial and because it deals with Darwinism-always a touchy subject with the biology establishment. I didn’t expect science to welcome an inquisitive reporter, but I did expect the controversy to be conducted at a rational level, that people would rightly demand to inspect my evidence more closely and question me on the correctness of this or that fact. Dawkins devoted two-thirds of his review to attacking my British publishers, Fourth Estate, for their irresponsibility in daring to accept a book criticizing Darwinism and the remainder to assassinating my own character in the sort of terms quoted above. I experienced this kind of witch-hunting activity by the Darwinist police when I first published Shattering the Myths of Darwinism and found myself subjected to a campaign of vilification. I had expected controversy and heated debate, because that is in the nature of Darwinism. But it was deeply disappointing to find myself being described by a prominent academic, Oxford zoologist Richard Dawkins, as “loony,” “stupid,” and “in need of psychiatric help” in response to purely scientific reporting. Thomas Huxley, Darwin’s champion, observed that the great tragedy of science is the slaying of a beautiful idea by an ugly fact. Darwin’s original conception was a beautiful idea. It seemed to offer an elegantly economical solution to the greatest mystery of all: the origin of life on Earth and the descent of humankind. Sadly, it has received too many mortal blows from the ugly facts of scientific enquiry to remain viable. It feels a bit like a scrapbook. But seriously, readers, one gets the impression that the Darwinians can’t afford to be quite as unhinged as that anymore. This just in: The Nineties called. They want Dawkins back. No rush. See also: Researcher: Male birds’ songs do not advertise intelligence It’s odd. The fact that he came to doubt the thesis after twenty years is the first time some of us sense a good reason to at least take it seriously. That is, the fact that a specific hypothesis of that sort might be wrong implies that others might turn out to be right, as opposed to mere Darwinian storytelling. Also, maybe relevant: New atheism is over, says Darwinian PZ Myers To judge from PZ’s post, it looks as though the new atheists are turning on each other instead of on the rest of us. Doesn’t a proverb somewhere cover that? 1. Let’s see. Ad Hominem, Circumstantial; Poisoning the Well; Avoiding the Issue. Rather tame for Dawkins. 2. On (1), Milton should not have felt the need to deny he is a creationist. It is irrelevant to his arguments. One can be a creationist and still give good arguments in support of one’s claims. 3. By Dawkins’ own yardstick he rules himself out of writing articles and books ‘evaluating’ (let’s be blunt: emotionally attacking) religion since it is no ‘secret’ that he is a swivel-eyed and dogmatic evolutionist/anti-creationist. Was there ever a time when Dickie D was not a bumbling buffoon? If Dawkin’s critique of Milton’s book is a little too personal for my taste, his exasperation is understandable in the context of having to defend evolution against the misconceived attacks of unqualified critics whose more significant contribution to science is as evidence for the Salem Hypothesis. Milton misunderstands the first thing about natural selection. He thinks the phrase refers to selection among species. In fact, modern Darwinians agree with Darwin himself that natural selection chooses among individuals within species. Such a fundamental misunderstanding would be bound to have far-reaching consequences; and they duly make nonsense of several sections of the book. In genetics, the word ‘recessive’ has a precise meaning, known to every school biologist. It means a gene whose effect is masked by another (dominant) gene at the same locus. Now it also happens that large stretches of chromosomes are inert – untranslated. This kind of inertness has not the smallest connection with the ‘recessive’ kind. Yet Milton manages the feat of confusing the two. Any slightly qualified referee would have picked up this clanger. There are other errors from which any reader capable of thought would have saved this book. Stating correctly that Immanuel Velikovsky was ridiculed in his own time, Milton goes on to say “Today, only forty years later, a concept closely similar to Velikovsky’s is widely accepted by many geologists – that the major extinction at the end of the Cretaceous … was caused by collision with a giant meteor or even asteroid.” But the whole point of Velikovsky (indeed, the whole reason why Milton, with his eccentric views on the age of the earth, champions him) is that his collision was supposed to have happened recently; recently enough to explain Biblical catastrophes like Moses’s parting of the Red Sea. The geologists’ meteorite, on the other hand, is supposed to have impacted 65 million years ago! There is a difference – approximately 65 million years difference. If Velikovsky had placed his collision tens of millions of years ago he would not have been ridiculed. To represent him as a misjudged, wilderness-figure who has finally come into his own is either disingenuous or – more charitably and plausibly – stupid.